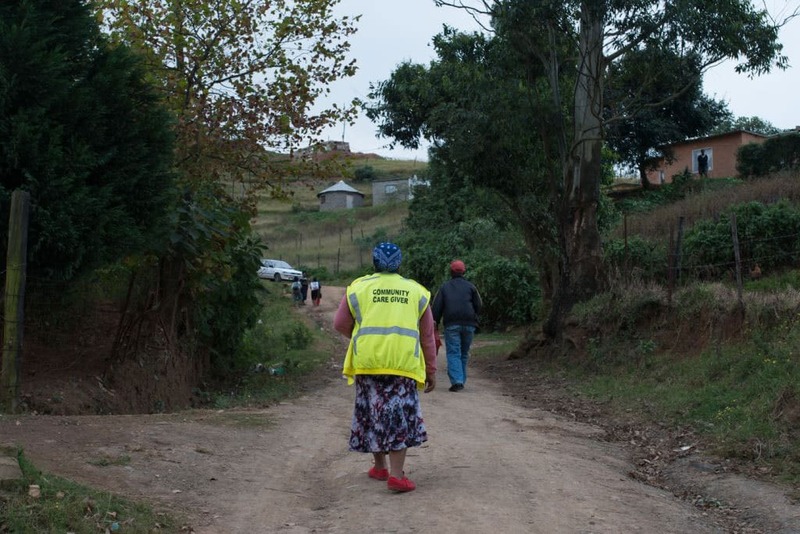 A community health care worker cleans an elderly woman during her visits around the community of Sweet Waters in KwaZulu-Natal. She resorts to using bread bags in the absence of gloves. unclear and controversial. How many do we need? What exactly should their role be? Who should employ them? What should they be paid? Is there good evidence to inform policy? Sasha Stevenson of SECTION27 lead Spotlight’s in-depth investigation into these pressing questions. The structure of our health system and the nature of our healthcare workforce are unsuited to the goals that we have set ourselves: universal health coverage; an ‘end to AIDS’; and the reduction in non-communicable diseases through preventative and health promotion services. These goals can’t be reached in a hospital-centric health system with unsupervised, NGO-employed and underpaid community health workers (CHWs) serving as the only community-based services in the absence of capacitated and reliable clinic and hospital outreach programmes. For some time, the national and provincial departments of health have been discussing and partly implementing a CHW programme. There have been multiple policy documents and there has been some action from provincial departments but we remain a long way from establishing a standardised CHW programme, let alone one that is capable of meeting the objectives of the health system, the National Strategic Plan (NSP), and the population. 2: Why do we need CHWs? 4: What should CHWs do? 5: How many CHWs do we need? 6: How should CHWs be employed? 7: How much will the CHW programme cost? Guys this is not on. I have been working as a contract worker since 2006 i started on nothing a month than 600 a month now im getting 2000 a month. I have a family tbat depends on me as iam the bread winner. Please employ us no has been on contract for this long. We need permanent jobs with benefits like any other goverment employee. Please help us this is too much.